December 29th and 30th had been marked as two exciting and important days in many of our calendar. No guess why? Department of Mathematics and Computer Applications (DOMCA) held their Alumni meet. Most of us got the news few months back from our beloved HOD when we went there for Login 2007 as guests. Ticket booking and preparation :-P started for many asap. In these two days we rejoiced most of our memories from meeting our 3rd God guru (teachers), evening entertainment, hostel cricket and a nice small one day trip served with instant dosa, malagai bajji, vaalakai bajji, onion pakoda and some delicious chicken biryani. Not last but, meeting my beloved class friends. We relived those good old days. A note of thanks, to all faculty members, dear DOMCA juniors who made arrangement for every sec of this meet. Also a special thanks to the senior Alumni’s who filled our stomach with some delicious food. Thanks to all for your wishes! Wishing you all a great year ahead. 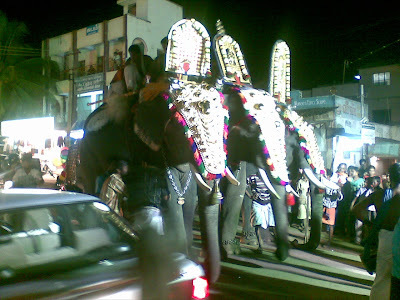 Elephant procession is a unique ethnic tradition mainly followed in many temples in Kerala. 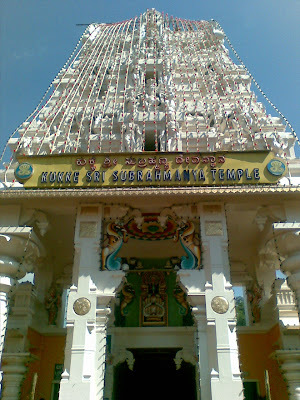 It is a major attraction in Tirsur temple. I witnessed this in my neighborhood on a small scale for swami 'Ayyiapan'. A mahout stands by instructing the animal. Two-three swami's sit atop of the elephant holding the God's idol. People water the street on their respect and occasional devotees feeding the elephant with banana's and in return being blessed by the elephants trunk. 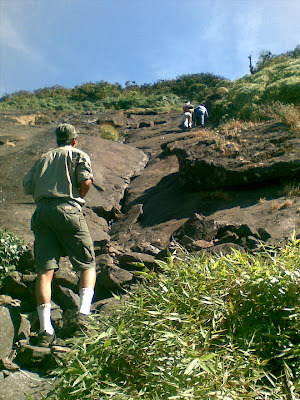 Skandagiri trek or famously called as the Moon Light Trek is small trek that all nerds can try out. Skandagiri or Kalavaarahalli betta is 70 kms from Bangalore near Chikkaballapur. Take a left from main road and head straight hit the end, take left hit the end, take left again to hit the foot hill. 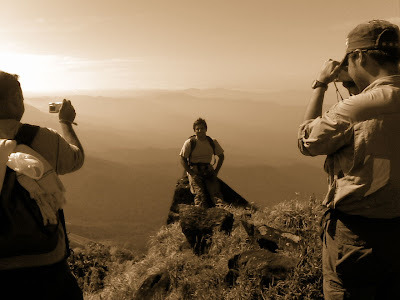 If its going to be a night trek, a guide is advisable (bargain your rates with them). Carry a white light torch (since yellow light does not penetrate fog/mist much) with good batteries. Carry snacks and water. The climb is less than 2hrs even for a new trekker. Reach the top before sunlight, to witness the amazing spectacle. Though we did not watch the sunrise properly due to heavy December fog, we had our own nature's artistic movements. I feel March would be a good time to visit. The cloud cover that surrounds the top is a spectacle to watch. A heavy meal for photographers. We are all set to go to Dharmasthala from Bangalore, the seats were separated 2+2+4 but eventually all are last row in different buses. How many times would we love to travel in last seat? Still myself and Vishal were in one. Around 2:30 the bus makes a stop for refreshments. Please make sure you refresh yourself. Visal spoke out, "The journey so far was good" Did some one over hear it, or we spoke early. Right after that refreshment break, it goes to a detour into a forest. OMG! Its 2 stories high bushes and in between in a path. It had all the bumps that keep the passengers in the last seat in air most of the time. Crazy driver speeds up in those road and manages an overtake. Morning when we got down it was like your back hammered. Then we refreshed in Gangothri (Not a river, but a lodge). We then soon reached Manjunatha temple in Dharmasthala. Had a good darshana. Then we buckled to goto Kukke. Since thats the place from where we need to start our trek. By the time we reached its lunch time. Then few of us went to Kukke Subramanya temple for the darshan. By the time we came back, it was already 20 min behind schedule for the trek. In a hurry we packed some snacks and fruits and all set to go at 4:20pm. 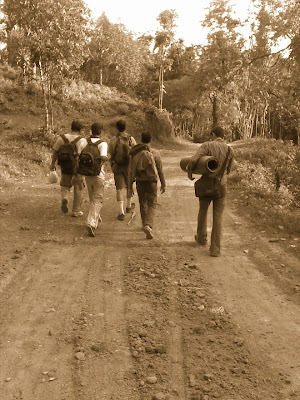 I picked up the phone, it was by friend who trekked the same place a week back. Then I briefly sketched him whats our plan for the trek and how we started. Then came his reply, "You have taken a bad decision. Its very tough to climb and you will not reach on time." buuusss(Flat tire) there goes all my hope of completing the trek. :) But then you will be hearing all such advices all through the trek, its left to one on what to take. The first stretch from base to our first check point (Bhattara Mane - meaning Bhatta's home) is around 5km, steep climb through the dense forest. This particular forest route from Kukke is a very tedious and demanding with high climb. But fortunate thing for us is we were on a non-monsoon season. So leeches would not be there. But the humidity within the woods was taking a toll on us. We were drinking water at regular intervals to keep us going. By the time we came out of the forest, sun began to set by 6:00pm. Crossed the grassland in dim light and by the time we neared Bhattara Mane it was dark and we need to use the possible source of light to make out our path. In brief Bhatta's is one individual who has made his settlement in that altitude. For years he had been a retreat to all the trekkers who come across. You get food (rice with sambar/rasam & pickle) which is no match to anything you get there. Shelter is available but on FCFS basic. All other basic amenities are also available. Even electricity is available through solar power. He's said to be a 'One man Army', a separate Aircel tower has been put up for people to reach him. At times Airtel also reaches there. Had a very good dinner for the tiredness we had and packed ourself with what ever warm cloths we had to protect us from the cold. Survivors would be Harshad & Shashank who were all prepared with their sleeping bangs. Others had a night to forget in the cold with the aroma of cattle parking next to us. We planned to get early in the morning and finish our breakfast and start around 6am. Somehow we managed to convince Bhatta for a quick breakfast and we were all set to start around 7am. It was a mild morning yellow sunlight. With fresh legs we soon reached the small stream of water near the mantap crossing the forest office where the toll is hiked to Rs 115. Pitstop1, after a nice refresh we reached the mantap. As usual Vishal was the first to climb it and followed by Venkat. After few clicks of photos we proceeded in the left side of the mantap. The sun has identified us and started to stimulate our sweat glands. The morning was an ideal time for the climb. Follow the trail to reach the false peek. From there we passed through the thick vegetation at the foot hill to reach the waterfall. During monsoon season this is the most dangerous section of the trek because of the slippery rocks. But we were playing hide and seek from the sun, either in the shadows of mountain or clouds. Lucky us. Finally nature was the winner when it roasted us at the top. This small moment: "I call it Happiness"
It gives you such level of achievement once you reach the top. A small ruined temple with a good big donated bell can be found. Did a small prayer before we started with some snacks. Then discussion on whats good, where's the other route, photography and a nice sleep in the shade. In 3hr 30 min we reached the top. 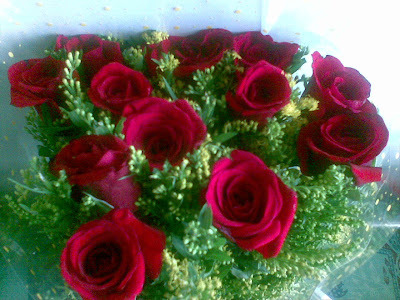 :) Time is up for us, we had been pushing ourselves so much for this small moment of Happiness. Then we began our way down. I was leading the pact for some time, but as usual was overtaken. On the way up and on the way down there were lot other trekking gangs to whom we passed by, each one giving others suggestions on how much it would take them to cover the rest of the distance. Some were really misleading, some were close. But 90% of them are software engineers for a weekend retreat from their desk. It was evident that Novell has become bigger, we met one of our fellow folks also. While we were nearing the Bhattara Mane it was almost 3pm and my skin was burning. It was the toughest part in the trek. 3hrs to climb down alone, though we came in a decent pace. From Bhattara Mane to Kukke was the last section on our decent. We already started making friends with other gangs and mingled groups when we were coming down. We started at 4:30pm, so we had at the max two hours to complete the descent before day light fades out. So we were trying to be slightly quick. It was tough like climbing two steps in a staircase with uneven base. You need to control your entire body weight in your knees and ankle. All through the trek, we were mostly divided into Hares and Tortoises. Hare's include Guru, Vishal, Shashank, Venkat. Fortunately or unfortunately I was part of the pace setting gang when we climbed down. Oh my God. They were sliding, twisting ankles, thudding their foot in tree roots, sweating and still moving in great speed. After my intervention they insisted to take first break. After 6 minutes another one at 2kms mark. Then I decided to seal my mouth and see if they have an idea of stopping. But they did not, I too followed them in good pace and we reached the base at 6:05 which was 55 minutes before the next gang reached level zero. I wish I had the power to give them imposition on "I will walk slow". But still thanks to those guys for bringing me out before it was dark. As soon as we reached Kukke, searched for hotel rooms to refresh us from the downpour of sweat, but due to the amavasa karthika festival, all prices were hiked up. They demanded 400 bucks for 2 hours. They a spark in someone took us to the lake nearby which was easily reachable by an auto. It was a wonderful bath in those water after a tiring day. :-P Then had our dinner and set back our journey to Bangalore. It was again bumpy ride though. As one of the Novell initiatives as Green Team. We were proud to say that we did not litter even a single plastic paper and carried them all down. At times I even picked up some plastic waste on the way and stuffed in my pant pocket. Some left out water bottles by other trekkers was also picked up. I would also complement the effort put by other fellow trekkers in doing the same. This is a small thing that we give back to nature. It has been an eventful days in my life. Somethings to remember, Somethings to forget. Life goes along as looking forward for a better and another eventful future. The Challenge of my Job is not as challenging of making enough time for my loved ones!